I like to share examples of political/policy humor, including self-deprecating jokes that poke fun at libertarians (we may be dorky, but at least we don’t want to control your life!). But I have a challenge. 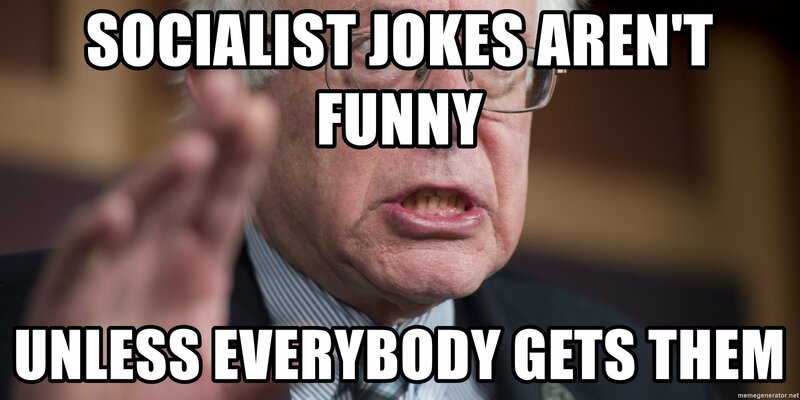 When sharing jokes that make mock leftist economics, I have to decide whether something is socialist humor, communist humor, or generic anti-leftist or anti-Democrat humor. And that’s sometimes not easy because the technical definition of socialism (government ownership of the means of production) makes it very similar to communism, but the man-on-the-street definition of socialism (a big welfare state) makes it very similar to Obamanomics or Clintonomics (Hillary, not Bill). 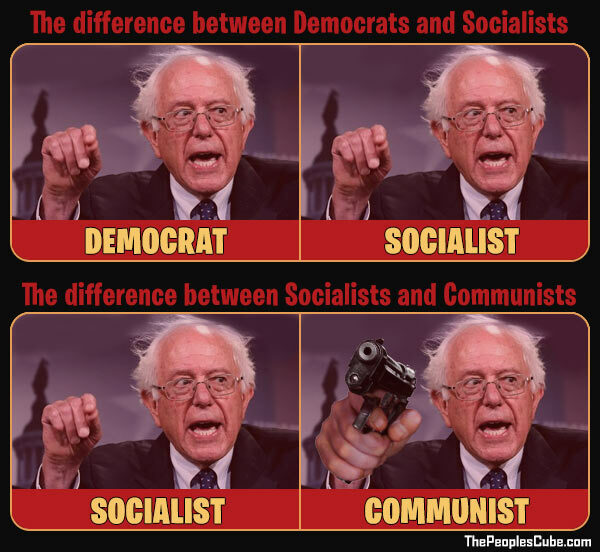 Well, whoever put this together wants us to believe that there’s no difference between Democrats and socialists, which is arguable (as Debbie Wasserman-Schultz will agree). But I think the part about the difference between socialism and communism is very clever. Kudos to whoever created this. I wrote an entire column on the difference between liberal socialism and Marxist socialism, but this gets across the same point much more succinctly. Moving on, I’m convinced that many of my leftist friends support bad policy because they have the mistaken view that the economy is a fixed pie. And when they start with that inaccurate assumption, they naturally think that a rich person’s wealth means poverty for others. And that’s reflected in this comparison. 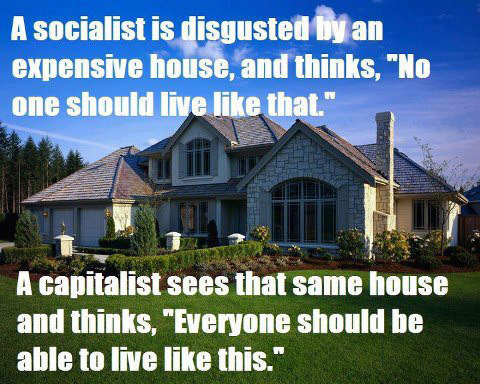 By the way, some people do get expensive houses under socialism, and you can probably guess which ones. Our next image wins the prize for subtle humor. Though I’m guessing Bernie didn’t laugh at this practical application of his philosophy. Next, from Reddit’s libertarian page, here’s an image that mocks the endless failure of statist economics. Yes, I realize that Venezuelan statism and North Korean statism aren’t the same (and that Ukraine is a failed kleptocracy more than anything else), but the broad point about the failure of big government makes this meme worth sharing. And since we’re on the topic of how big government fails everyplace where it’s tried, let’s conclude today with a video that was turned into humor by the addition of a five-word caption. At the risk of injecting some serious discussion into today’s column, allow me to preemptively address the leftist argument that Scandinavian nations show that socialism can work. In global ranking of economic liberty, Nordic nations score relatively high, with Denmark and Finland in the top 20. Scandinavian nations have large welfare states, but otherwise have very laissez-faire economic policies. Nordic nations got rich when government was small, but growth has slowed since welfare states were imposed. P.S. If you want even more socialism humor, click here, here, here, here, here, here, here, here, here, and here. …On current trajectory the much faster growing average world prosperity will have reached the anemic growth Nordic countries by year 2050-2060 — thus expunging the great advantage Nordic countries built over centuries, in less than a century — i.e. in the few short decades since their welfare states were established. …And to try to preempt the “convergence” principle: if that principle were true then there would not be prosperity disparities amongst countries. As soon as a country fell behind its growth rate would immediately accelerate and it would quickly catch up. Obviously this is not the case. Not only is it not the case, but with human ingenuity now providing unprecedented and irreversibly increasing leverage, disparities are bound to become ever larger. However little of all this general and deterministic framework really matters, because, to the voter-lemming a redistribution dollar today is worth ten promised perpetually compounding libertarian high growth dollars in the future. Hence a Bernie sanders who will cement America’s subpar growth, and thus inevitable decline, is in America’s cards sometime in the near future. I guess it’s just human nature. Just like human nature is fundamentally incompatible with socialism’s success, so is that same nature eternally attracted by it. Hence, only a small serendipitous subset of nations will lurch forward into the incredibly fast exponential growth awaiting humanity. My core task as an individual is to keep an eye for those countries and move there — well before Americans take out the pitchforks in response to the inevitable Greek style crisis American finances are leading to — and I’d suggest others do the same! One of the main reasons I read Dr. Mitchell’s articles is to get some insight as to where should our family find refuge once the American Titanic starts taking in water. Hopefully, between the time America hits the iceberg by electing a Bernie Sanders and the time the pitchforks finally get into the streets in desperation there will be enough time to pack up and leave in an organized way. But the time will be short so one must be prepared if they want to escape relatively unscathed. So I’d advise others to also prepare, because as everything human irreversibly accelerates towards an otherwise brilliant future for humanity, these changes will now be happening ever faster. Some people will be poor through no fault of their own. Disability and other misfortunes. Forcing others to become poor too isn’t the answer. a wise mouse knows crumbs don’t fall from empty tables! Ami Horowitz: Communist Manifesto or Democratic Platform? A great share TO SPOTLIGHT!! !